Many practices exist for managing rainwater runoff on your property. Called Low Impact Development (LID), these practices help control and minimize runoff leaving your property. For ideas on how to manage your runoff, this site will periodically post different practices. What is a Rain Garden? Understand what a rain garden is an how it helps beautify your yard and protect the environment. (Slide show with audio). A rain garden is a planter bed 6 to 12 inches deep into which rain from your downspouts is directed, usually a site at least 10 feet from your foundation and slightly downhill from your downspout. Site suitability is important! If a one foot deep hole filled with water drains within 24 hours, it is suitable for a rain garden. The rain garden is a depression about one foot deep and sized to be approximately one tenth the size of the roof area drained by your downspouts. Adding 4 to 6 inches of good compost provides a good planting medium. Downspouts can be directed to the rain garden by creating a dry rock streambed or burying a pipe to the garden. Rain gardens can be planted with a variety of shrubs and perennials similar to a garden bed. Virtually any plant that does not require well drained soil will work. Native plants work best as they are less susceptible to disease and drought. Integrating the design of the rain garden into the rest of your landscaping provides the most pleasing results. Rain gardens are often focal points in the landscape. Rain Garden Handbook for Western Washington Homeowners. A downloadable resource from WSU Extension covering rain gardens from design to digging to maintenance. Have you ever had the unfortunate experience of seeing your driveway flood in the wet months? Or maybe you’ve had some plants that drowned in the winter rains, but just don’t have enough water in the summer? Do you have tons of overgrown blackberries and ivy in your yard? If any of these issues sound familiar, this information may be of use to you. What’s stormwater? Where does it go and why is it important? 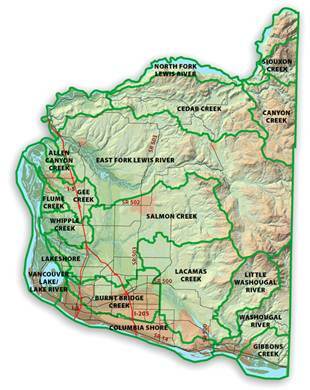 The image to the right shows the major watersheds of Clark County. All rain falls into some watershed, which is the area of land where all groundwater and rainwater falling within its boundaries drains into the same place (More at What is a Watershed?). In the Pacific Northwest, most water once fell directly onto the ground and soaked into the soil. However, we’ve altered the landscape with buildings and other construction, changing where the water ends up. Stormwater runs off impervious surfaces, such as roofs, driveways, and sidewalks. As the water flows over these surfaces it collects a number of pollutants, including motor oil, pet waste, grass clippings, dirt, and litter. In the more urban areas of Clark County, the water goes into stormwater drains which lead into streams and eventually to the Columbia River. This can harm wildlife and people alike. 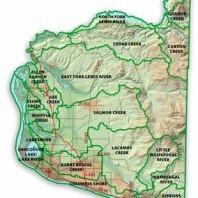 You can look at the health of different watersheds in Clark County at Clark County, Washington’ Stream health and monitoring pages. What can we do about this? In a nutshell, we can help the land do its job to filter out pollutants from our water, instead of directing all of the stormwater to streams and other waterbodies. One way to do this, called low impact development (LID), directs the flow of water back into the ground. LID practices include rain gardens (image below), pervious pavement, using drought-tolerant plants (especially native plants), and planting the “right plant for the right place”. 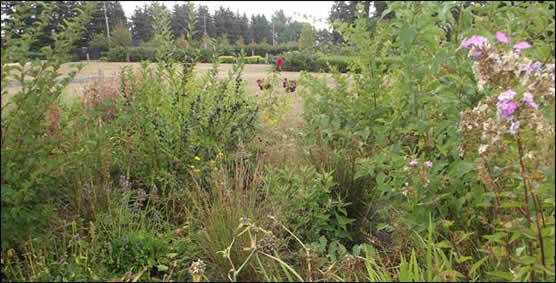 A rain garden at the Pacific Park Natural Garden Demonstration Site in Vancouver, WA.